Western blot analysis of extracts from NIH/3T3 cells, pretreated with wortmannin #9951 and/or rapamycin #9904 as indicated, then untreated or PDGF-treated, using Phospho-Akt (Ser473) (587F11) Mouse mAb (upper) or Akt Antibody #9272 (lower). Phospho-Akt (Ser473) (587F11) Mouse mAb detects endogenous levels of Akt only when phosphorylated at serine 473. 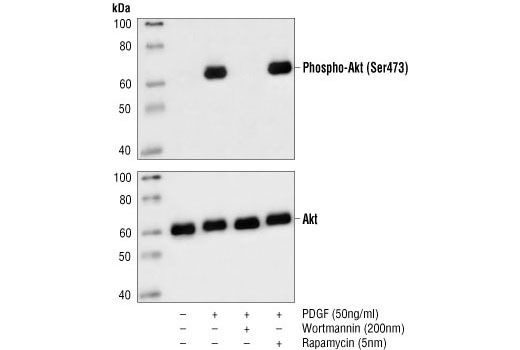 This antibody does not detect Akt phosphorylated at other sites or related kinases such as PKC and p70 S6 kinase.